What a day to choose!! 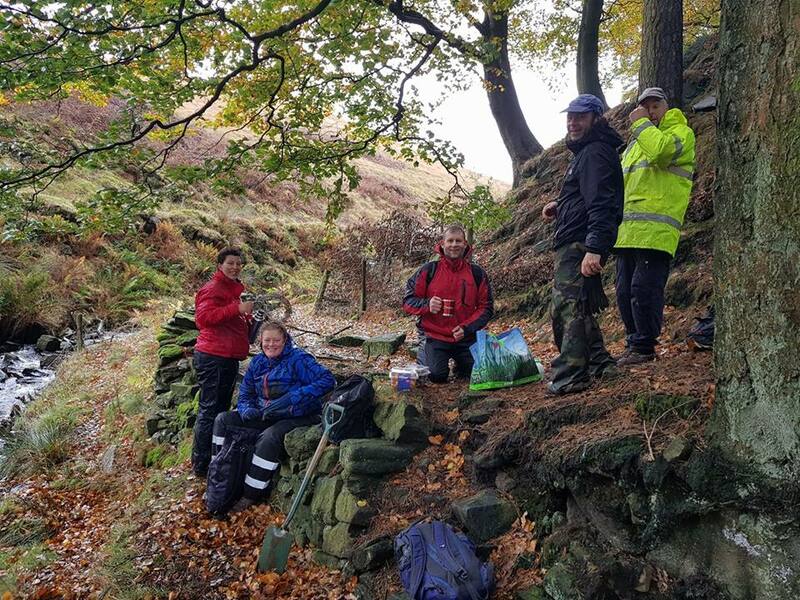 With Storm Brian at its height, why would a group of TRF members walk to an isolated Peak District hillside in late October?? 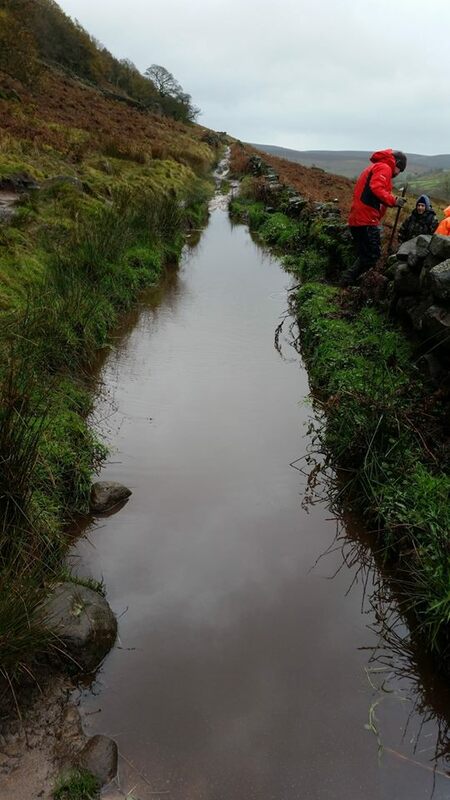 After last year's successful drainage works at Cumberland Cottage, High Peaks and Potteries TRF member Pete Potts was asked if we would do some more this year. After discussions with the Peak Parks Conservation Volunteers, it was decided that the Three Shires Head (or is it Three Shire Heads???) lane could do with a bit of fettling. 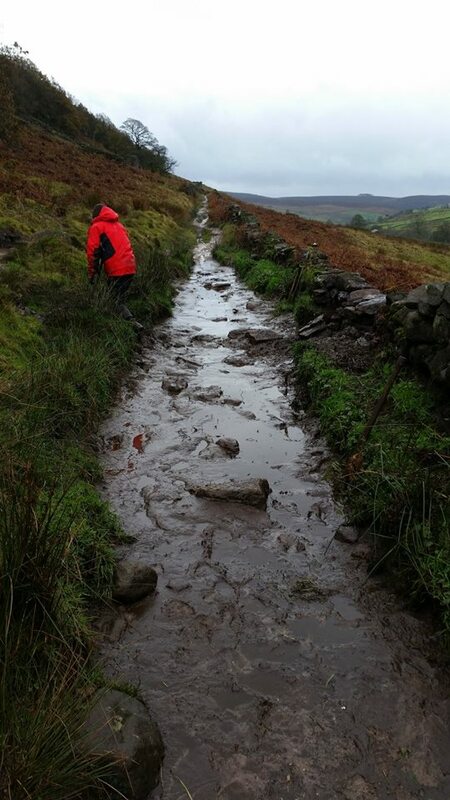 This lane is one of the many ancient lanes in the Peaks. The bridge over the River Dane is at the confluence of Cheshire, Derbyshire and Staffordshire. The lane is closed to 4-wheelers, but in either direction is a lovely rocky slope down the valley side to the waterfall and bridge, then a climb up across the other side of the valley. 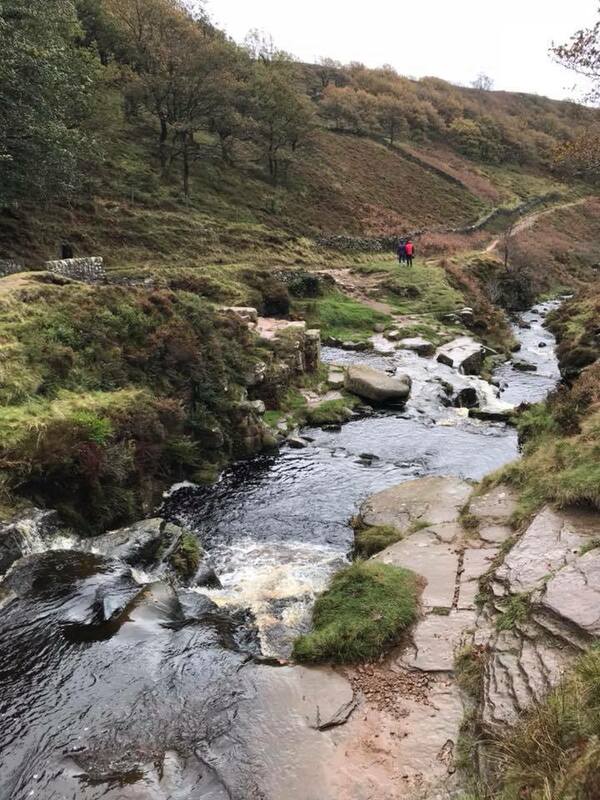 The scenery is typical Peak District - wild, with a few trees, and the river babbling over the rocks and falls in the valley. Lovely. We met up with the Peaks Parks Volunteers Rangers at their base near Tittesworth Reservoir. We piled into their 4x4 Sprinter van and took to the narrow roads of the area before a 15 minute walk down to the bridge - the lane itself isn't wide enough for a 4 wheeled vehicle, never mind trying to take a LWB Sprinter down there! 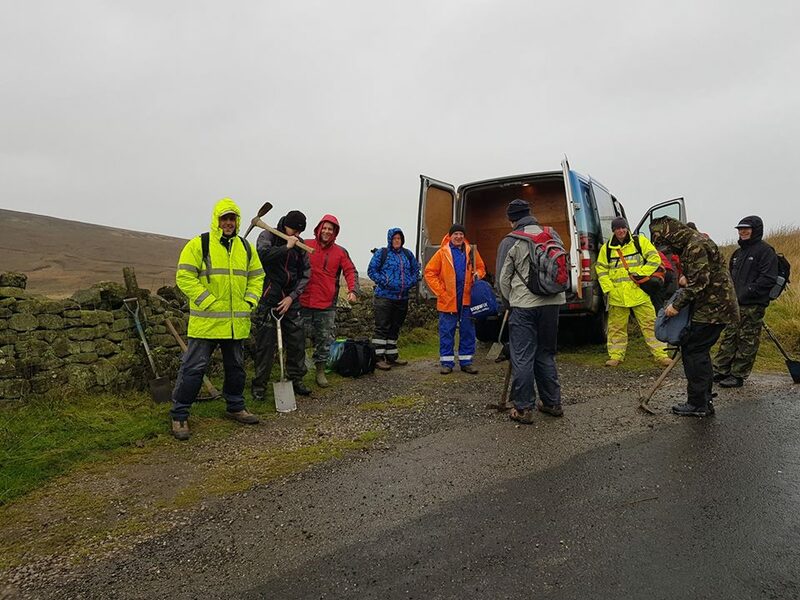 All was calm as we unloaded spades, pickaxes, pinch bars etc, but no sooner did we close the van doors and the heavens opened in a way that is true Derbyshire (or were we in Cheshire then??). Needless to say, waterproofs of various sorts, with no sartorial elegance whatsoever were donned! At the bridge, we split into two work parties. 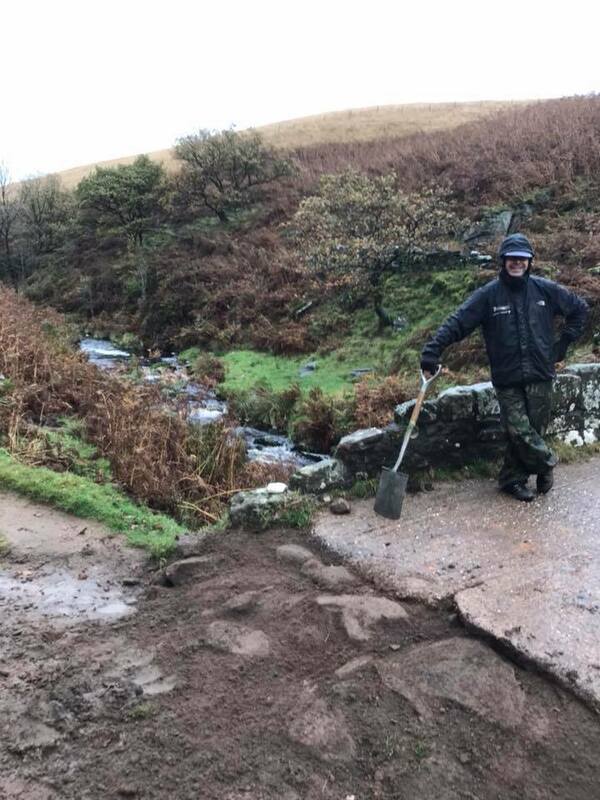 One was to repair erosion to the bridge entrance, the other was to try and drain a large, deep puddle half way up the valley. This puddle had been in existence for some time, so walkers had made an "alternative" path to avoid it. 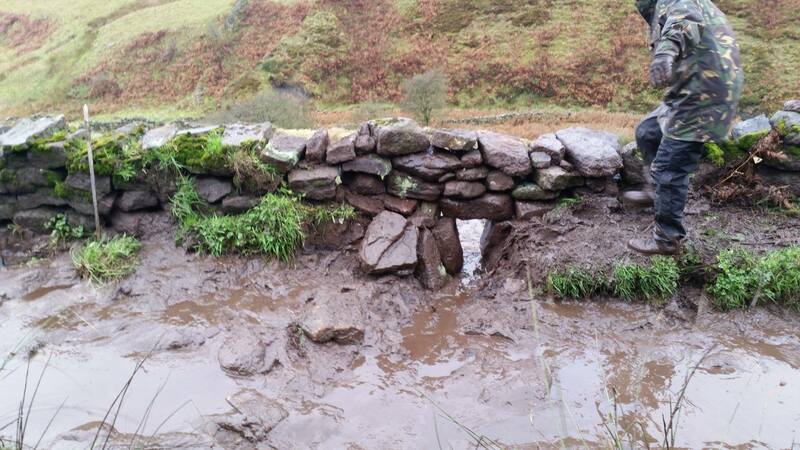 At this point the drystone wall had fallen down, leaving a gap. Attempting to drain the puddle by thrusting the pinch bar under the "downhill" side of the wall created small gushers that were quickly blocked by silt. We made the decision to take the wall down, put in a drainage slot and rebuild it, along with the fallen part as well. Digging the trench by the gap in the wall resulted in hundreds of gallons of water cascading down the hillside towards the river below - coincidentally soaking the stones we had placed there for the wall rebuild. Perfect. Suitable stones were chosen and the wall rebuilt, with mud and silt being shovelled away. The Ranger was very impressed to say the least! 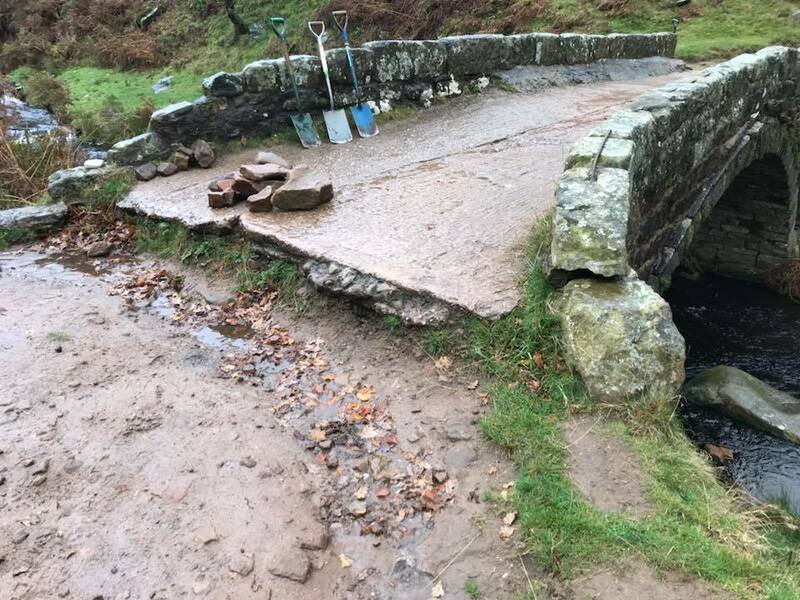 Meanwhile, the other party had been scavenging and scrounging for stone to repair the entrance and exit to the bridge, where there was a substantial step. Sweating with the slippery, muddy stones in the rain. Did I mention the rain? It wasn't raining any more. It was throwing it down. Horizontally. Oh Joy. But they manfully (and womanfully) built the ramps, then filling them with spoil to bind it all together. In the process, others were draining puddles on this and the adjacent footpaths. Eventually, the rain eased off, and we completed our tasks, tired and mildly moist - but we agreed that we'd had a lot of fun and lots of laughs. Nobody got injured or fell over/off, which was a bonus! However, the walk uphill back to the van got some of us puffing and panting (well, I was anyway). It's a lot easier riding up it than walking up it, spade and pickaxe in hand. The Rangers seemed very happy with what we'd done - and so were we. In fact I think we're all looking forward to some more works next year. Hopefully without Storm Brian interfering. A beautiful spot. But better in the sunshine. So many thanks to all that came and worked. Thanks to the Rangers for support and transport. Great ambassadors for the TRF and trail riding in The Peaks. Job well done by all. You should be proud of yourselves. Maybe this post could be included in the next edition of Trail? As a group, it's the best PR High Peak and Potteries group can do. I enjoyed the day and I'll put my hand up next time the call for volunteers goes out.